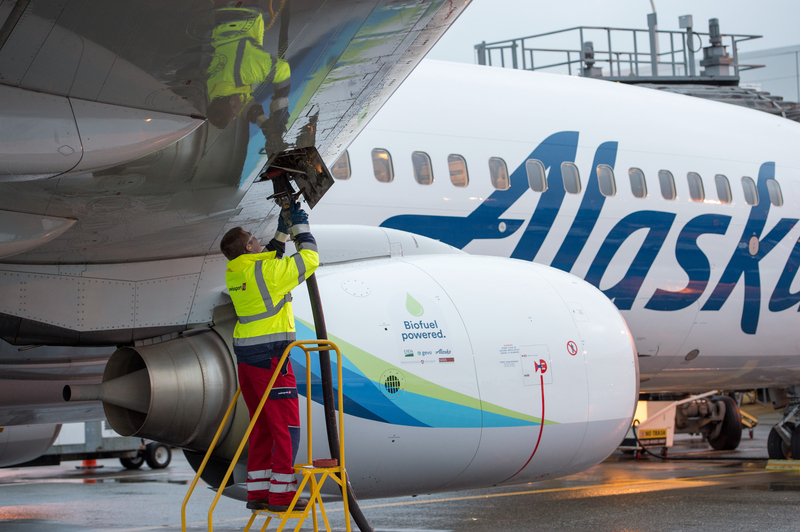 Swissport fuel manager Jarid Svraka fuels an Alaska Airlines flight powered with a 20 percent blend of biofuel made from forest residuals in Sea-Tac Washington on Nov. 14, 2016. Alaska Airlines made history today flying the world’s first commercial flight using a new sustainable alternative jet fuel made from forest residuals from the Pacific Northwest – the limbs, stumps and branches that are left over after a timber harvest or forest thinning of managed forests on private land. The flight departed this morning from Seattle-Tacoma International Airport to Reagan National Airport in Washington, D.C., powered by a 20 percent blend of the new, sustainable biofuel sourced directly from the Pacific Northwest. The fuel for today’s flight was produced by the Northwest Advanced Renewables Alliance (NARA), led Washington State University. NARA is a five-year initiative that unites 32 member organizations from the academia, aviation, private industry, and the government, that came together under a USDA grant to demonstrate the viability of producing alternative jet fuel from forest residuals. Gevo, Inc., a NARA partner, successfully adapted its patented technologies to convert cellulosic sugars derived from wood waste into renewable isobutanol, which was then further converted into Gevo’s Alcohol-to-Jet (ATJ) fuel. Believed to be the world’s first alternative jet fuel produced from wood, the fuel meets international ASTM standards, allowing it to be used safely for commercial flights. Gevo Vice President of Regulatory Affairs Glenn Johnston holds a sample of the biofuel, which the company made by converting cellulosic sugars derived from wood waste into renewable fuel. Flight 4 departed Seattle Tacoma International Airport at 8:20 a.m. on Nov. 14, 2016. NARA partners send off the first commercial flight powered by forest residuals. Pictured left to right are Port of Seattle Commission President John Creighton; Alaska Airlines senior vice president of communications and external relations Joe Sprague; U.S. Congresswoman Suzan DelBene, ranking member on the Subcommittee for Biotechnology, Horticulture and Research; Gevo, Inc. vice president of regulatory affairs Glenn Johnston; Washington State University NARA director Ralph Cavalieri; and Bill Goldner, director of sustainable bioenergy at the USDA National Institute of Food and Agriculture. 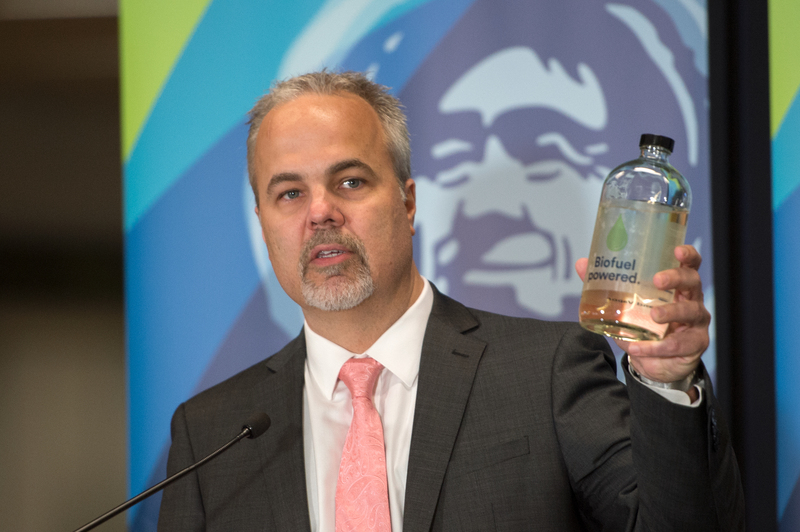 The biofuel used on Alaska Airlines flight 4 comes from excess forest residuals collected from sustainably managed forests owned by Weyerhaeuser, the Muckleshoot Indian Tribe and the Confederated Salish Kootenai Tribes. The flight departed Sea-Tac Airport in Washington on Nov. 14, 2016. While traditional forest practices leave some of the harvest materials behind to replenish soil nutrients and provide cover, the excess forest biomass is usually is piled and burned. The biofuel used in this flight was made from excess forest residuals collected from both sustainably managed forests owned by Weyerhaeuser (OR), the Muckleshoot Indian Tribe (WA), and the Confederated Salish Kootenai Tribes (MT), as well as rejected wood fibers from Cosmo Specialty Fibers (WA). Using forest residuals for biofuel feedstock is exciting because it does not compete with food production; air pollution is cut by reducing slash pile burning; removal of residuals prepares the forest floor for replanting; and the new industry of woody biomass collection and conversion helps create jobs in rural economies. Also, forest residuals are abundant and can be sustainably supplied from private lands. Sustainable alternative jet fuels reduce greenhouse gas emission by 50-80 percent over the lifecycle of the fuel- from growth of the feedstock, transportation to a processing facility and production. The actual emission reduction depends on the type of feedstock used. Today’s flight will emit approximately 70 percent less CO2 than conventional petroleum jet, a win for the environment and Alaska Airlines alike. 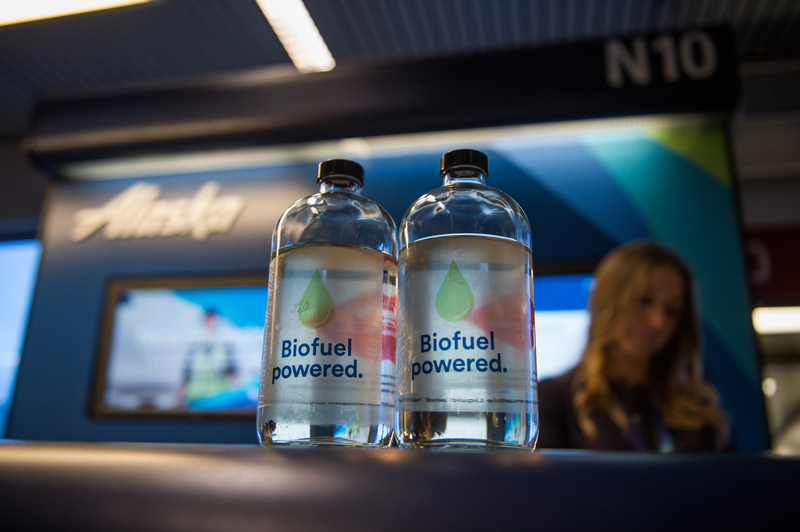 Alaska Airlines flew two more flights in June using a blend of biofuel produced from the non-edible portion of sustainable corn. 19 comments on "Alaska Airlines flies first commercial flight with new biofuel made from forest residuals"
Just curious. How does the new fuel compare financially I don’t think the industry will use it if it costs a lot more more. Possibly a State like Maine could also produce this fuel since they have since they have a lot of forest land also. This is fishy. If its a 20% blend, then how can it achieve a 70% savings in emissions. Hi PB – the emissions savings are in the life cycle and production of the fuel. Once it is produced, it is nearly chemically indistinguishable from typical jet fuel. by definition and standard, you can can blend uo to 50%. anywhere between 5-50% is considered as biojet. For stable combustion in air, you need aromatics in pertroluim. may be future, this ratio can be increase. I am very delighted to see my technology: from wood to sugar became reality. It is a home run for me abecause I was trained in aero engine combustion, but had a career change to forest product. I was a student worker on this bio-fuel research project & am excited to see it come to fruition! Way to go Alaska Airlines! That would give a whole new meaning to “Mile High” Congrats Alaska Airline. You just made this 75K very proud. Thank You for being the fantastic airline that you are! You should consider Hemp as your biofuel source. It is sustainable, provides a large amount of fuel at lower costs, and also provides other resources while providing soil Remediation in areas that may have radiation or need cleanup. You would be helping the world in so many ways if you would switch to Hemp. If you need information or access to qualified professionals in my industry, please contact me. logistic of hemp is very difficult due to density. Thats inovation!! !…that will be a big change for invioment and menkind. Proud to say that Alaska Airlines made “One giant for mankind”! Good way to go aal. Dose the exhaust smell like pine trees? 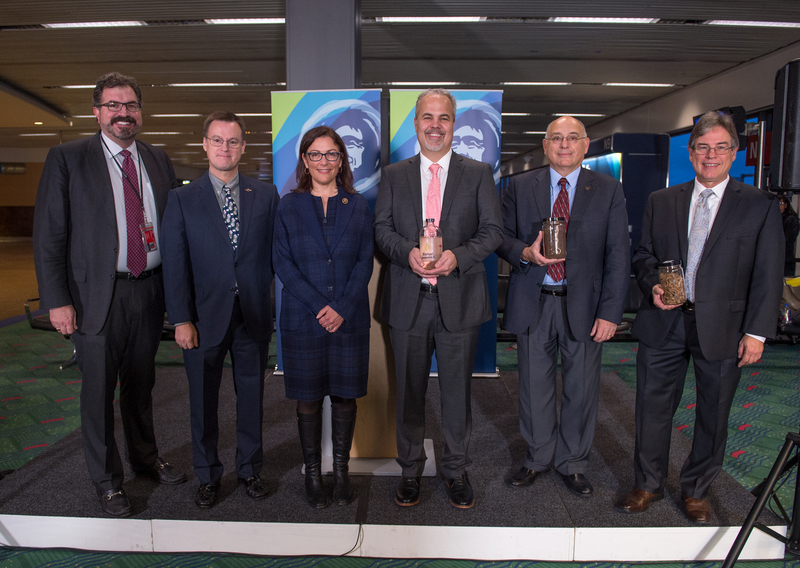 Thank you Alaska Airlines for your commitment to research, collaboration, working with universities, and advancing green solutions to address global challenges. Way to go Alaska Airlines!! I’m proud that you are my number one carrier!! Next time I fly to ANC I will be powered by plants!